What could be better than a box of treats and baking supplies, picked out just for you, on your doorstep? 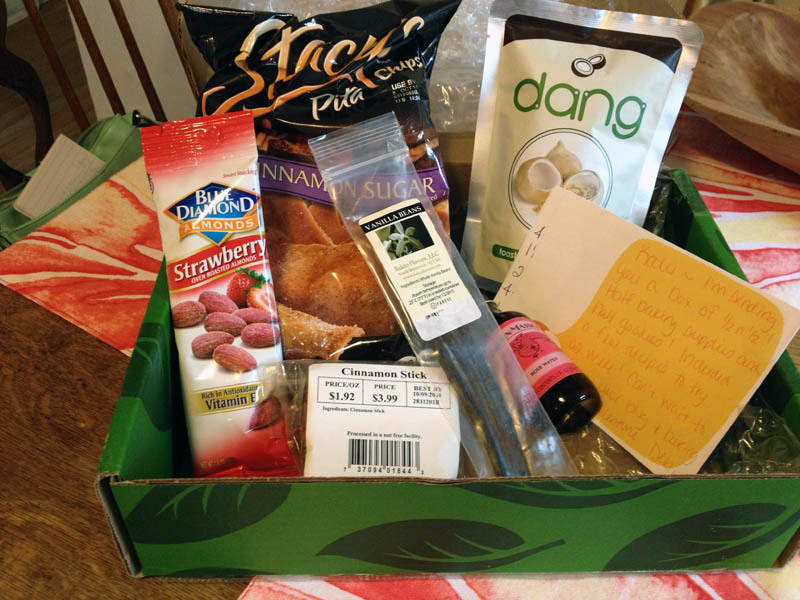 Thanks to Deb for the great first foodie penpal package! Deb sent me a sweet note that explained the box was half baked goods and half goodies. Cool idea! In addition to two handwritten recipe cards (pumpkin dip and icing), the baking ingredients were vanilla beans (perfect for the new Pure Vanilla cookbook I tested out at work! ), cinnamon sticks, and rose water (I’ve never used rose water before, so I’m looking forward to baking with it now. And, I’ll have to try Deb’s recipe for rose water icing, which she says pairs well with cardamon cupcakes.). The snacks included strawberry almonds (went right into my desk drawer at work for one of those days I desperately need a treat! ), cinnamon pita chips (Deb recommends serving with the pumpkin dip recipe, will try soon!) and toasted coconut chips. Having never tried these before, I decided to add these crispy chips to a trail mix I threw together. Snacks are incredibly important in surviving 3-7 hour board meetings, and I liked the tropical flavor the coconut added to my dried fruit/nut/chocolate chip combo. If you want to participate, and/or learn more, visit the Lean Green Bean blog.